The course is given by the Department of Archaeology and Ancient History at Uppsala University in collaboration with the Centre for Environment and Development Studies, CEMUS. 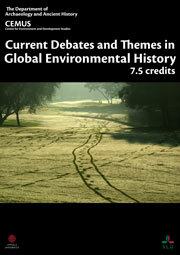 The course is a part of the international Master Programme in Environmental History. Contact us at anneli.ekblom[a]arkeologi.uu.se with your questions. A warm welcome to the course! Annei Ekblom Lecturer, Department of Archaeology and Ancient History.